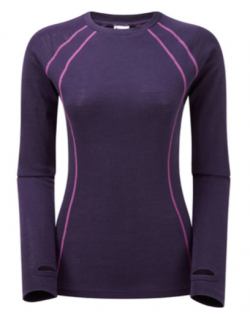 I bought a few bits in SportPursuit’s merino sale, including this Trekmates zip-neck and crewneck tee. The Contrast Stitch Zip Top is 100% merino and 200gsm, while the Fusion Crew is 50% merino, 50% polyester and is also 200gsm. 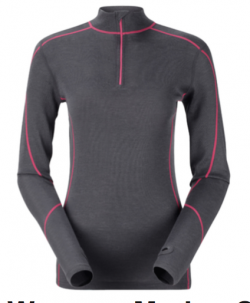 Both feature the same plentiful flatlock stitching in a contrast colour, and thumbholes in the sleeves. Both of these items seem very good for the money. They’re definitely baselayers – too transparent to wear as daywear tops but the merino’s good and soft and the stitching is nice and flat. The feel on the fusion is slightly silkier than the 100% merino. The zip-neck’s neckline is a little lower than I like, but the zip garage is welcome, while the neckline on the crewneck gives me a bit more coverage than my Eddy tees, as well as being about 70gsm heavier. Both items are comfortable to wear and have washed nicely, but they are shorter that I would like, and tend to ride up with wear – here is where the company has economised somewhat. For the money, though, they were a bargain – 24.34 euros for the zip neck (reduced from 58.54) and 14.59 euros for the crewneck, down from 35.12.